The photo attached to this blog can be replicated in many family albums. 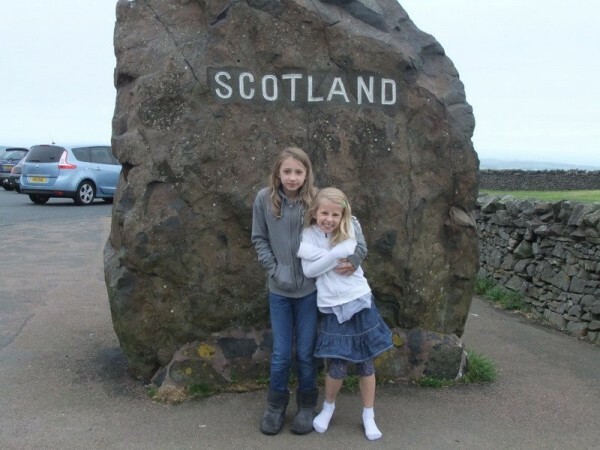 The girls here happen to be my goddaughter and her sister, on their way to visit friends and family in Scotland, but they might equally be my children on the same mission north. There remains a slight sense of travelling to a foreign land, where the language, the landscape, the money, the dress, the dancing and even the food can all be a little bit different. I remember the same experience from my childhood, only I would have been travelling south. Such differences, together with much deeper impressions of history, culture, buildings, and law, are under scrutiny in 2014, as Scotland approaches the independence referendum in September. Given that my main research interest is Older Scots literature, I am fascinated by the ways in which differences between Scotland and England are figured, both in the Middle Ages and in our contemporary world. Modern differences are often given a history as justification for their existence; genuinely medieval differences have, in contrast, sometimes vanished over time. So then, what were the differences in language, literature, historical narratives, building styles and law were evident before the Union of the Crowns in 1603? What, precisely, has been inherited from our medieval forebears? And what do we misremember or misinterpret? Now I think I can give a fairly good account of language and literature, and I will probably try to do so here over the next few weeks and months. For the other aspects, however, there are people much better qualified. So next month the Institute of Medieval Research will host a public workshop to explore these issues: there will be three speakers, refreshments and an opportunity to ask questions. It will be held on Wednesday 26 February, beginning at 3.30 in the Senate Chamber on University Park. The speakers will be Dr Jenny Wormald, Professor Hector MacQueen, and Dr David Caldwell: each is a leader in their field, and each brings a different perspective to the question of English and Scottish medieval difference. Dr Caldwell has recently retired as the Keeper of Scotland and Europe and the the National Museums Scotland; he is an archaeologist and an expert in material culture. Professor of Private Law at the University of Edinburgh, Professor MacQueen is currently seconded to the Scottish Law Commission, a body responsible for updating and improving the law of Scotland. Dr Jenny Wormald is Honorary Fellow in Scottish History at the University of Edinburgh; she is particularly well known for her work on Mary, Queen of Scots and James VI and I, as well as previous studies on medieval Scottish nobility.